Back when recording things from TV was the only way to obtain certain movies you didn’t want to actually buy, I recall a friend of the family giving my family their collection of TV-recorded VHS tapes, most of them set to the longest recording time in order to maximize the content they had. One of these tapes contained both the original Karate Kid (save for the first couple minutes) and, yes, Return of the Jedi, making this the first time I ever actually could claim any sort of ownership over any of the Star Wars movies. Naturally, I watched it pretty often, and the mere fact that this was the only one I could watch without having to go seek out any rentals or borrow them from friends made this movie my second favorite (because there’s just no questioning the greatness of The Empire Strikes Back, kids). Now that I do own both trilogies (twice over for the original trilogy, thanks to the 2006 “limited” release of the DVDs which contained the original theatrical versions), however, the flaws of the once-final chapter in the Star Wars saga have really become rather apparent, thanks in large part to the prequels kind of bringing them out retroactively. Naturally, the Ewoks are a large part of this – they’re a sort of proto-Gungan race of diminutive and primitive teddy-bear-like creatures who, likely in fear of audiences growing weary of C-3PO, were also added in to provide the film with its comic relief, despite also being inexplicably competent enough to help in taking down what are supposed to be some of the finest soldiers in the Imperial Army in the film’s climactic but embarrassingly laughable battle on the surface of Endor, the Ewok homeworld. Their presence also mars what should have been an emotionally satisfying conclusion to the trilogy, with the cast of the last two films relegated to celebrating their victory amongst a bunch of bears who like to shout “Ay, chihuahua!” – because Lucas is apparently still 5-years-old and thinks that’s funny. Don’t get me started on the goofy music sung at the end more commonly known as “Yub Nub,” either. (Jedi may have gotten the worst of the revisions over the years, but it also received one of the best, too, when they axed that terrible song in favor of the lovely and far more appropriate composition John Williams wrote to atone for his sin in the 1997 version.) This was the beginning of the infantilization of Star Wars, and it’s often quite painful. It’s not just the Ewoks, though. 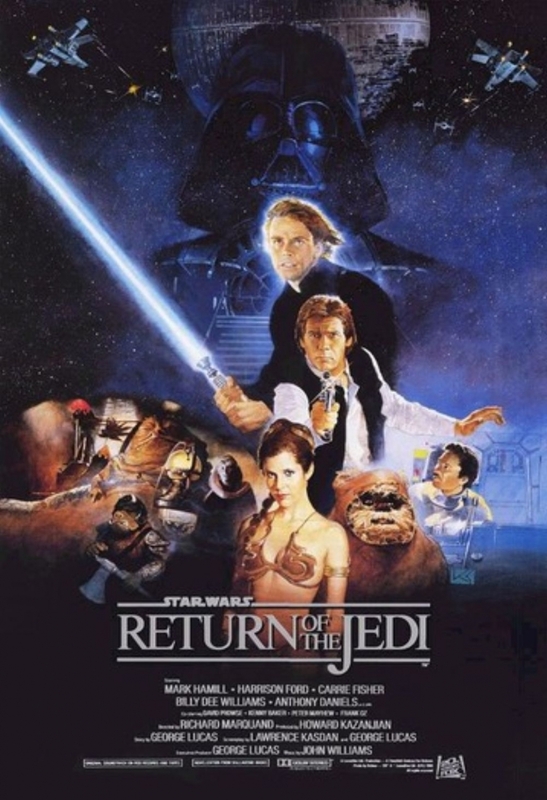 The script is surprisingly dull, condescending in its exposition, and starts taking the humor in an increasingly juvenile direction, but at least the returning cast also overcomes the often dull scripting to have a few memorable moments – Luke’s pretty awesome now, though Han’s definitely lost his edge, and Chewie’s Tarzan cry is about as dumb as the Ewoks’ Spanish interjections. The plot feels a bit like it’s a remixed Greatest Hits compilation of the other two films, with just enough adjustments made to make it feel like story progression and threat escalation rather than just the saga repeating itself (though a friend of mine recently pointed out that was likely the intention, too, since George Lucas has an odd understanding of what “poetry” and “rhyme” are, which… explains quite a lot). We return to Tatooine, only this time we get to meet the grotesque Jabba the Hutt and his cadre of freaks who apparently, um… like to sleep over…. There’s a return to Yoda, which is all well and good, of course, since we can only assume Luke needs more training… (except, not?). There’s also another reveal about Luke’s family tree that gives awkward subtext to the previous two films. Most of these are at least different enough to forgive, but Lucas apparently also saw fit to have the climax yet again be an epic struggle to destroy an even bigger Death Star than the one featured the first time around! Yes, the grande finale of one of cinema’s most enduring and epic trilogies is no more than more of the same. Return of the Jedi is a film that highlights the fact that George Lucas really had likely run out of ideas at this point and, for the only time in his life, decided that if it ain’t broke, don’t fix it. Return of the Jedi isn’t really a bad film, of course. It’s just that, in comparison to all the greatness that came before, it’s not a very satisfying conclusion, either, especially once you realize that empires really don’t crumble all that quickly just because you’ve killed off two of its top leaders. (No, I’m not counting the now-irrelevant Expanded Universe, but I’m sure Episode VII will address this somehow.) A lot of what the film actually does do well, though, is still immensely entertaining, even with some of the repeated stuff. Earlier scenes within Jabba’s palace are weird but entertaining, and the speeder chase through the Endor forest is pretty damn thrilling. The battle over Endor between the Rebels and the Imperial fleet is pretty exciting, too, given the expanded scope and easily rivals the dogfights seen in the first film. And once the film stops cutting to the freaking teddy bears, the battle of minds and lightsabers between Luke, Darth Vader, and the Emperor is pretty riveting on an emotional level, even with Ian McDiarmid’s somewhat excessive portrayal of the Emperor. I’m actually quite thankful that we’re getting a proper continuation of the series. As I said before, Return of the Jedi isn’t a terrible film and provides more than its fair share of entertainment value while at least somewhat bringing to a close the journeys these characters began from A New Hopeonward. If you liked any of the films that came before or after, it’s essential viewing, by all means, but keep in mind that it’s certainly nowhere near being on the same level as the first two films in the series, too. It’s a shame that what should have been the most thrilling chapter of the series ended up being marred by poor storytelling and too-cute-for-its-own-good sensibilities when it came to character portrayals. The saga deserves better, for sure, but at least we know now, for a fact, that it could’ve been so, so much worse.